Over the past few months, ECE Design has be overhauling, consolidating and updating our Websites to provide an improved user experience. Inclusive of the overhaul was our brand new ECE Support Desk we rolled out a few weeks back. In the last few days, we have reached our goal of consolidation and over the next week we will refine some of the details. The final piece of the consolidation plan was to bring together our cadworxblog.com website with our ecedesign.com website and I am happy to say this was completed yesterday! As it stands, http://www.ecedesign.com is our main and only domain moving forward. We hope the Website Design is “pleasing to the eye” and the changes make it easier to find information! Product Webpages – Inclusive of all the CADWorx & Analysis Pages with detailed descriptions of the software, brochures along with supporting overview videos. Support, Training and Services Webpages – Inclusive of the all the Services ECE provides. Blog – ECE provides announcements regarding the CADWorx & Analysis Solutions along with tips, tricks and insights for maximizing your productivity. Event Calendar – ECE maintains a calendar of upcoming CADWorx & Analysis Events including our upcoming training schedule along with our Free Webinars and Workshop. The Event Calendar has a subscribe function that enables you to bring the calendar directly into Outlook or Google Calendar. Webinars & Training Videos – Through the Membership component of our website, ECE provides access to our Webinar & Training Videos. Access to Webinar Recordings is provided to all registered users. At this time, access to Training Videos is provided to ECE Customers Only. Instant Answers: Get solutions fast with the built-in live search feature. Simply type in an expression in the search box and it will display all relevant articles from the Knowledge Base. FAQs: Find answers to frequently asked questions about our products and services. Tech Notes: Find white papers and solutions to technical questions on CADWorx, CAESAR II, PV ELITE, GT STRUDL and the rest of our software lineup! Support Tickets: Submit a support ticket to contact the ECE Support team. When you log into the ECE Support Desk, you will find a tab called “My Tickets”. Here you can find all of your previous and current tickets. In addition to that you are able to view, reply to, or close tickets directly. Community Involvement – Many of our enthusiastic customers like to lend a hand in helping each other by answering questions. Often times this allows for a support question to be initially replied to in an even faster time frame. Is PV Elite tied to a beam solver? – Yes, for Natural Frequency and Response Spectrum Calculations. Where is the option for a field hydrotest value? UG-99(c) is an option available with the other test options, vertical or horizontal test can also be specified. Is there a way of modifying the factor for membrane stresses, in the WRC 107 local stress analysis for a nozzle? Not directly, but we have options for using stress indices as well as Kn and Kb. What is the screening criteria for vortex shedding? The vibration possibility is a function of the weight, height and diameter of the vessel. How are lugs supported when they are added to a vessel? Lugs are assumed to be bolted to the attaching structure. Does a WRC 107 calculation in PV Elite include pressure thrust? This is optional. What criteria is used to evaluate holes in skirts? This analysis is per EN-13445. What default parameters are used to define lifting lugs? The default parameters are simply hard coded into the software. What is the method used to do a WRC 107 calculation on an elliptical head? Based on the head diameter an equivalent spherical diameter is computed. What methodology is used to find wind loads on platforms? The area is based on 1 of 4 methods that are commonly used by large E&C companies. The basic force then becomes the pressure times the area. When you have two sets of lugs, upper lug calculations don’t show up? PV Elite only solves for the loads on the first set of lugs. 2 sets makes for a statically indeterminate problem. Why does acceleration occur on lug supported vessels? How are the lugs being supported? Something has to accelerate during an earthquake. In our analysis the vessel accelerates around the supports. Can we use STS-1 for the ASME Steel Stack Analysis? Yes, for cylindrical stacks. 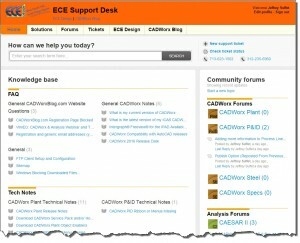 July 8, 2015 – ECE Design is pleased to announce the introduction of our new ECE Support Desk that will allow us to provide an improved support experience to better resolve your questions regarding the CADWorx & Analysis Software Solutions. The ECE Support Team is now up and running on this new ticketing system. This system will provide ECE greater visibility to your requests, allowing faster replies and giving you the very best customer service. The ECE Support Desk also provides greater visibility to you our customers. By visiting the ECE Support Desk, you can check on the progress of your tickets, read FAQs and Tech Notes, and participate in the conversation in our new and improved CADWorx & Analysis Forums. 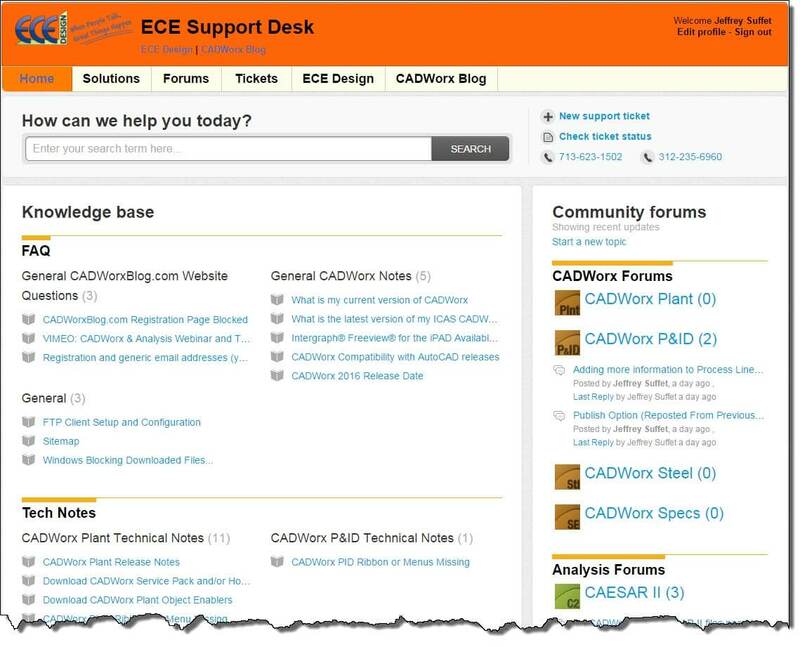 The ECE Support Desk is a web portal through which our customers may submit technical support requests, find CADWorx & Analysis technical information and query other customers using our new CADWorx & Analysis Forums. All requests routed to the ECE Support Desk are given a Ticket Number so that we can begin working on them and they can be tracked by you. Support Requests can still be submitted via email in the normal way to support@ecedesign.com and tickets will automatically be generated. In addition, you can now submit requests via the Client Support section on our websites: ECE Design, CADWorxBlog, (Just Click on the Orange Support button on the left when you get to either website) or on the Support Desk Website. Instant Answers: Get solutions fast with the built-in live search feature that works on the Support Portal as well as the ECE Design and CADWorxBlog.com Websites. Simply type in an expression in the search box and it will display all relevant articles from the Knowledge Base. Community Involvement – A better Forum System: Many of our enthusiastic customers like to lend a hand in helping each other by answering questions. Often times this allows for a support question to be initially replied to in an even faster time frame. The current Forum System on the cadworxblog.com website was cumbersome and hard to manage. This new forum location is much cleaner and will accept images with a simple paste command. Topics are slowly being moved over from the previous forums on the cadworxblog.com website. Go to the ECE Support Desk and press the login button in the upper-right hand corner. The site will automatically redirect you to the cadworxblog.com website where you will be able to log in using your existing email and password. If you have not previously registered for the cadworxblog.com portal, now would be a great time to take advantage of all the information that is available and register. Once logged in you will be automatically redirected back to the ECE Support Desk. One final click on the Login button should refresh the screen and show you as logged in. Please bear with us over the next couple of weeks as we switch to this new system, but we ask that you send us any feedback you have including suggestions for improvements and we will try to incorporate them if possible.